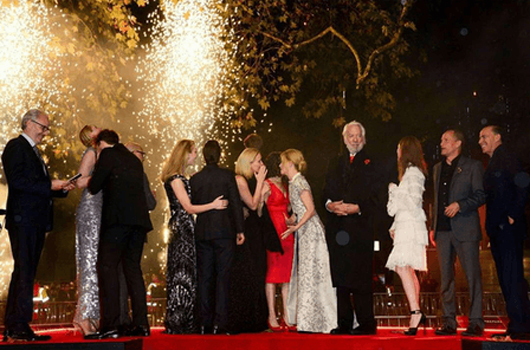 We were approached to provide some close proximity pyrotechnics for the Film Premiere of The hunger Games Mockingjay Part 3. The films advertising visuals featured a lot of flames and fire so the producers wanted to include some aspect of this into the launch night in London, which also fell on Bonfire Night so it was a good fit for the event. Secondly was the firing site, in the middle of Leicester square with thousands of fans expected to turn out to the see their favourite actors walking down the red carpet. It wasn’t just the close proximity to the public, but the large number of trees and low hanging branches which we had to consider when selecting the right products for the display. Thankfully this job was booked several months in advance which gave us the rare luxury of time, something which is uncommon with our clients. We needed to increase the skillset and experience of 2 employees so we accelerated their training program. We run some dedicated training sessions throughout the year but the majority of training is completed on the job. We take additional crew than is required to complete the required tasks enabling a senior member of crew to take a step-back, let someone else manage the job while they are coached or monitored. We looked at our upcoming projects and identified key opportunities where we could develop the crew who could then gain the experience we required to fulfil our busy period. We negotiated a large safety perimeter with the event organisers , providing us with a large section of the garden in which to work within. This gave us greater flexibility to stager the products in-between the trees finding pockets of space where we could safely position the products. The crew were re-allocated across the displays and all the newly trained managers stepped up to the plate. The Film Premiere and all the Bonfire Night Displays went without a hitch.